Onion vada is a Kerala cuisine. It is not soft like bajji and not so crispy like pakoras but texture is neutral between both. It is crunchy on outside and soft on inside. Easy to make snack within minutes. You can prepare this snack with limited ingredients already available in your pantry. 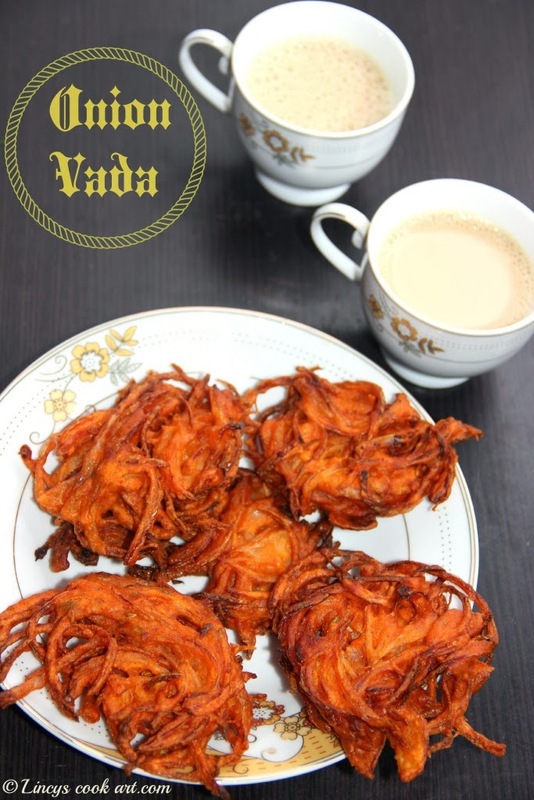 These vadas perfectly suit this cool climate with a cup of tea. I love the crispy edges of the vadas. The mild sweetness of the onions covered with spicy batter gives a perfect balanced taste. Combine gram flour, rice flour, chilli powder, fennel seeds, asafetida and salt, mix well dry with hand or spoon. Then onions should be coated in the batter but the batter should not be too loose. Then add the onions and mix well. Do not squeeze the onions. Take some mixture and deep fry in oil till crispy and onions becomes slightly brown on edges. Note: The batter should not be watery. If its watery the vadas will tastes like bajji. Onion portion should be more than the batter when you take a hand full of batter to fry. Always select large onions to make this vadas that gives a proper shape like threaded vadas. I'm a big fan of onions, in fact I can eat them raw. I am the loving the crunchy edges and that crispy texture. Its perfect when dipped into chili sauce. This snack is one of my weekness......crunchy and crisp onion fritters...mouthwatering here. its snowing here, so perfect with hot cup of tea. Very crunchy. perfect with a cup of coffee. Looks very crunchy and onion vada is my one of favorite snack. My al tym favorite one.